Speaking engagements for attorneys are a strong marketing, public relations and business development tool. They are a great way to enhance your reputation, build your clientele and increase your visibility – which can lead to more business. With so many opportunities out there, it can be hard to determine which venue is right for you and doubly hard to get selected once you’ve decided on an event to speak at. These steps will help get you on your way to becoming a speaker in demand. Build your connections: Speaking engagements provide opportunities that put you in front of key decision-makers and influencers, giving you a rare opportunity to interact with clients and prospects face-to-face. Seeing you speak will give your audience a sense of your personality and demeanor, a critical factor for prospective buyers of legal services. Position yourself as a thought leader: To build your reputation as a leader in your area of practice, you must be regularly visible in your field and share your knowledge with others. Speaking engagements allow you to demonstrate your experience by providing a venue where you can deliver valuable content and position yourself as a leader. 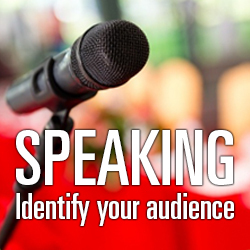 Increase visibility beyond the presentation: Your speech gives you value beyond the conference venue. By strategically sharing a video of your presentation or your slide deck online, you take better advantage of the content you’ve created by making it accessible to a wider audience. Identify your target audience: Speaking engagements are about extending your brand and cultivating leads for your law firm. The right audience is key to achieving these goals. Consider the audience you want to attract, and pick your speaking venues accordingly. If there won’t be people in attendance who are potential clients, or people who can influence potential clients, then it’s not worth your time. Speaking in front of other lawyers at ABA and CLE meetings won’t necessarily help you if you want to connect with medical industry CEOs. Conversely, an ABA event may well be the perfect venue for your topic if you are targeting referral sources. Research to find appropriate events: It’s important to be strategic if you want your efforts to translate in a bigger way. If you’re speaking at a well-chosen conference, there’s more than your time on stage to consider. You’ll have opportunities to meet and mingle with prospective clients, pursue one-on-one meetings and discover new networks – networks you may not have been able to join otherwise. Determine the type of event that is best for you: There are many places where one can speak – but big or small, they can all achieve the impact you are looking for. In fact, sometimes starting small can help you break into the bigger, more competitive events. Local Chambers of Commerce, Rotary Clubs, ABA chapters and similar organizations can help you become more visible in your immediate community, while national conferences and conventions offer the chance to gain visibility in front of industry decision-makers. Be a participant first: When I research speaking opportunities for Jaffe clients, event organizers often ask if the prospective speaker has attended the conference in the past as a participant. Organizers want to see that you are invested in the subject matter and care about the conference overall, not simply the speaking opportunity itself. Being a conference participant allows you to see the kinds of people who speak, get to know the organizers and connect with the key people who will be making speaker selections for the following year. Hot topics get attention: Speakers offering speeches on trending topics are more likely to get chosen. That’s because timely or provocative topics will attract attendees’ attention. When submitting your speaker submission, include information that helps you and your topic stand out from the crowd. Keep blogging: One of the best ways to land speaking engagements is to blog. People who write about specific subjects consistently and intelligently will, over time, be increasingly regarded as thought leaders. Once you have established yourself as a unique and vital voice, speaking opportunities are much easier to come by. Not blogging yet? Here are some ways for you to get started. Follow up after your submission: Most often people will send in their abstracts, sit back and wait for a response. Follow up and persistence can be the difference between getting selected and having your topic moved to the bottom of the pile. A simple phone call a few days after you send in your proposal can ensure that you won’t be forgotten. If you want help finding the right speaking opportunities for you, feel free to contact me, Jennifer Faivre, at jfaivre@jaffepr.com.